There is no safe level of smoking. If you smoke, whether it’s every day or once in a while, it is all extremely harmful to your health. Quitting smoking is one of the best things you can do for your health, and not just yours, but the health of your family and friends too, as second hand smoke can also be harmful to those around you. Smoking is a major risk factor for many NCD’s and in particular, Lung Disease such as cancer, Fiji’s 4th biggest killer. According to the latest STEPS Survey (2011), 16.6% of Fijians smoke every day, whilst this is a drop in numbers from the last STEPS survey (-0.9%), the average age for starting smoking has gotten younger, from 22.2 to 20.7. With all that we know of the harmful affects of smoking and legislative support for a smoke-free Fiji building with more areas being declared smoke-free, it is time to kick this nasty habit out of Fiji! If you are a smoker, you may feel like there are benefits to smoking, but there are no positive benefits from smoking. In fact, cigarette smoke contains over 4,000 harmful chemicals. Three of these chemicals are hexamine, acetone and arsenic – hexamine is used in paint and lacquers, arsenic is used for rat poison, and acetone is used in nail polish remover. When you light up, you are smoking poison; do you really want all of this inside your lungs? 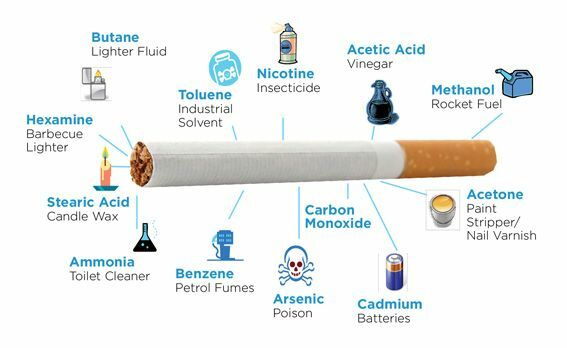 This image shows just some of the bad chemicals found in a single cigarette. Smoking poses a risk to just about every part of your body; the list below illustrates the risks to the many parts of your body. Is it really worth risking all of this? Blood: Cancer of the myeloid line of blood cells. If you quit smoking, your body starts to repair the damage within weeks of quitting. While there is no cure for some diseases caused by smoking, such as COPD, the best way to control any damage to your body and those around you, is to stop smoking. If you are struggling to find the motivation to quit, perhaps these points below will help you. Remember, your smoking isn’t only affecting your health, but that of your children. Children who have parents who smoke as 7 times more likely to smoke themselves. Children who are around smokers are more likely to catch coughs, colds, wheezing andhave breathing difficulties. Smoking dramatically increases the risk of cot death (sudden unexpected death in infancy) for infants. Smoking increases the risk of your children contracting middle ear infections. Smoking increases the risk of your children getting meningococcal disease. Smoking increases incidences of asthma attacks in children. Why does quitting smoking seem so hard? Smoking tobacco is both a physical addiction and a psychological habit. The nicotine from cigarettes provides a temporary, and addictive, high. Eliminating that regular fix of nicotine will cause your body to experience physical withdrawal symptoms and cravings. Because of nicotine’s “feel good” effect on the brain, you may also have become accustomed to smoking as a way of coping with stress, depression, anxiety, or even boredom. At the same time, the act of smoking is ingrained as a daily ritual. It may be an automatic response for you to smoke a cigarette with your morning coffee, while taking a break from work or school, or during your commute home at the end of a long day. Perhaps friends, family members, and colleagues smoke, and it has become part of the way you relate with them. To successfully quit smoking, you’ll need to address both the addiction and the habits and routines that go along with it. Take the time to think of what kind of smoker you are, which moments of your life call for a cigarette, and why. This will help you to identify which tips and techniques may be most beneficial for you. Do you feel the need to smoke at every meal? Are you more of a social smoker? Is it a very bad addiction (more than a pack a day)? Do you reach for cigarettes when you’re feeling stressed or down? Are there certain activities, places, or people you associate with smoking? Is your cigarette smoking linked to other addictions, such as alcohol? Are you someone who is open to talking about your addiction with a health worker, friend or counselor? Are you interested in getting into a fitness program? Throw away all of your cigarettes (no emergency pack! ), lighters, ashtrays, and matches. Wash your clothes and freshen up anything that smells like smoke. Shampoo your car, clean your house, mat and bedding etc. A positive attitude is key to quitting; you need to be motivated and able to think positively when quitting feels hard. Make a promise, set a date and stick to it. Don’t be put off by a wedding, party or other time when you’d normally smoke, no more excuses. Is your after-dinner cigarette your favourite? Some foods canseem to make cigarettes more satisfying. Others, including cheese, fruit and vegetables, make cigarettes taste terrible. So swap your usual BBQ or burger for a veggie-filled meal and double the benefit to your health. Fizzy drinks, alcohol, cola, tea and coffee all make cigarettes taste better. So when you’re out, drink more water and juice. A craving can last five minutes. Before you give up, make a list of five-minute strategies. For example, you could leave the party for a minute, dance or go to the bar. And think about this: the combination of smoking and drinking raises your risk of mouth cancer by 38 times! If friends or family members want to give up too, suggest to them that you give up together. Let your friends or co-workers know that you plan to quit and they can help encourage you and keep you on track. When you’re at a party or out at a club, stick with the non-smokers. “When you look at the smokers, don’t envy them,” says Louise, 52, an ex-smoker. “Think of what they’re doing as a bit strange – lighting a small white tube and breathing in smoke.” Being around people who smoke can really make it hard to stick to your plan, with many clubs now becoming non-smoking, it is easier to ignore those smokers ducking outside. This can make your efforts to quit twice as likely to succeed. If you can’t afford nicotine patches, you could try sucking on a lolly or chewing gum to get rid of a craving, or just try getting up and going for a walk to distract yourself. Try putting a drinkof water in the hand that usually holds a cigarette, or drink from a straw to keep your mouth busy. Stopping smoking improves the body’s bloodflow, so improves sensitivity. Men who stop smoking may get better erections. Women may find that their orgasms improve and they become aroused more easily. It’s also been found that non-smokers are three times more appealing to prospective partners than smokers (one of the advantages, perhaps, of smelling fresh). Non-smokers find it easier to get pregnant. Quitting smoking improves the lining of the baby bag and can make men’s sperm more potent. Most importantly, it improves the chances of giving birth to a healthy baby. Giving up tobacco stops teeth becoming stained, and you’ll have fresher breath. Ex-smokers are less likely than smokers to get gum disease and lose their teeth prematurely. Half of all long-term smokers die early from smoking-related diseases, including heart disease, lung cancer and chronic bronchitis. Men who quit smoking by 30 add 10 years to their life. People who kick the habit at 60 add three years to their. life. In other words, it’s never too late to benefit from stopping. Quitting not only adds years to your life, but it also greatly improves the chance of a disease-free, mobile, happier old age. Scientific studies show that people’s stress levels are lower after they stop smoking. Nicotine addiction makes smokers stressed from the ‘withdrawal’ between cigarettes. The pleasant feeling of satisfying that craving is only temporary and is not a real cure for stress. Also, the improved levels of oxygen in the body means that ex-smokers can concentrate better, sleep better and have increased mental wellbeing. Within two to 12 weeks of stopping smoking, your circulation improves. This makes all physical activity, including walking and running, much easier. By stopping smoking you’ll be protecting the health of your non-smoking friends and family. Passive smoking increases a non-smoker’s risk of lung cancer, heart disease and stroke. Second-hand smoke doubles the risk of children getting chest illnesses, including pneumonia, croup (swollen airways in the lungs) and bronchitis, plus more ear infections, wheezing and asthma. They also have three times the risk of getting lung cancer in later life compared with children who live with non-smokers. There are many resources available to help you quit. See our related flyers section for many Fijian guides or check out some of the websites below. You can also email the MOHMS on tobaccofreefiji@yahoo.com to ask for help from our tobacco unit.